It was Friday afternoon and we had about 30 minutes until Shabbat was to begin when we arrived at Roberta & Ted’s house in the northeast of Beijing. As friends of Felix’s parents who have lived in Beijing for 20 something years, they graciously offered to take us in while we were in town. We were greeted by Ted and went to quickly freshen up in time to leave the house and drive with Roberta and Ted to Kehillat Beijing before official candle lighting time. The non-Orthodox Kehillat Beijing was just what one would expect from a suburban American Reform synagogue, but rather small and peer-led. We arrived halfway through the 45 minute service. Immediately after the service ended, Felix was asked to lead kiddush and we were all invited to sit down for a kosher style meal where we could eat the fish and vegetarian options. It wasn’t quite our style, but we definitely enjoyed the people and the conversations over dinner. Our walk back to Roberta and Ted’s was an hour and a half long. With pleasant weather and good directions from our hosts, it wasn’t too bad. The next day, we woke up to a rainy morning and debated whether or not we wanted to brave it for a 45 minute walk to Chabad. Eventually, with encouragement from Ted, we donned our rain jackets and set out – and we were glad we did. The service was a traditional Orthodox service (on fast forward). It was over an hour after it began. We were a bit shocked and somewhat impressed as well. Over the delicious lunch that followed, we made friends with a nice Israeli couple, Michal and Shlomo, who had moved to Beijing a year and a half ago. Lunch was over before we knew it and were joined by Joey, a British student, and Lauren, an American student, both in Beijing to study Chinese. We followed the group to Akiva and Liora’s house where we hung out for the rest of the afternoon. Turns out that Liora had stumbled upon our blog before even meeting us – we were famous! Back at Roberta and Ted’s, we ordered in some pizza once Shabbat was over together with the Van Loen family, also guests of Roberta and Ted who were traveling the world for a year with their pre-teen children. It was really fun and interesting to swap travel stories and tips. Sunday morning, we took it easy, did laundry and skyped with our families. We took advantage of the close proximity of the 798 Artist District and went for a 2 hour stroll through galleries, stores and restaurants. Needing a snack and curious to try some authentic Chinese street food, we bought a jian bing – an crispy wonton wafer and fried egg wrapped in a crepe with bean paste, scallions and lettuce. It was really good! We arrived back at the house, packed up our stuff, said our goodbyes and took a taxi ($18) to our hotel near the Temple of Heaven. We were very excited to be spending the next week and a half with our friends, Hannah and Neil who had come from Israel to spend their vacation traveling with us. The room at the Bestay Hotel ($24 / night) was so small that when the four of us sat around to make plans, one of us (usually Felix) had to sit on the porcelain throne (the toilet), but don’t worry since the bathroom walls were all clear glass and the room was tiny, he was always included in the conversations. Coming from Israel, Hannah and Neil were shocked by the glass cage that was the bathroom (for some reason, the Chinese have a thing with clear-walled bathrooms). While we still didn’t like it, there were very few things that could shock us by this point on our trip. Our first order of business was to get some dinner and the four of us ventured out happy to be exploring together. We found a basic restaurant where we had some tofu noodles and veggies and sat around sipping some beers ($13), planning out our next few days, and reflecting on China. Early Monday morning, we brewed some espresso and the four of us sipped it together in our room (Felix atop the toilet again) before setting out to explore the city. Our first destination was the Forbidden City, and we made a brief stop on the way to the metro (2 Yuan / $0.35 for each ride from here on out) to collect some energy with something that resembled an egg crepe, but different from the one we had tasted earlier in the week at the 798 Artist District, from a street stall ($0.80). A few stops away on the metro and we gazed over into Tienanmen Square before entering the gates of the Forbidden City. We bought our entrance tickets ($10), rented an audio guide ($6.50) and proceeded to race through the entire complex, as it turned out that it closes early on Mondays. The structures and plazas were magnificent, and through the huge crowds of (mostly Chinese) tourists we managed to view many details, some large and some small – figurines atop buildings, carved marble and wood, bronze statues, and more and more. The gardens were beautiful, full of old trees and decorated gazebos, and eventually we found ourselves being ushered out of the gates on the other side of the complex just in time for the 12:30pm closing. Tired from having completed our visit to an important landmark, but still with most of the day ahead of us, we decided to take a stroll through a hutong (traditional neighborhood made up of narrow alleys and courtyards). Hungry for some lunch, we had a seat at Otto and enjoyed a delicious and refreshing chrysanthemum and honey iced tea, along with fried mushrooms, an eggplant dish, and some noodles ($20). Reenergized, we took a bus (1 yuan each /$0.16) to the Yashow Market for some shopping, stopping along the way to purchase flights and train tickets. Finally ready to get some dinner, we attempted to leave the market, only to be stopped in our tracks by the massive downpour outside. Along with many other shoppers, we stood under the overhang in front of the market and gazed out at the wall of water ahead. At this point, we were approached by a young Chinese woman with a great English accent, who offered us her services as a tour guide. We didn’t pay her much attention at first, as we had grown accustomed to ignoring touts of various sorts, but as we thought it over and compared her offer to our other options, we decided to go for it and booked Ridvan for a tour of the Great Wall of China for the next day. With that sorted out, we braved the rain and ran to the upscale mall next door, hoping to find a taxi. Turns out finding a taxi in Beijing in the rain is more challenging than in NYC at rush hour, so we ended up taking a rain check on the Peking Duck experience in favor of a fancy Chinese restaurant which Ridvan had recommended. After a 20 minute wait for a table, we shared noodles, eggplant, dumplings and a tofu dish ($26 with drinks). The food was delicious and we were even more tired after eating, so we found our way back on the metro (a long 30 minute journey) and called it a night. Tuesday morning at 9:00am, after downing our espresso, Ridvan and the driver (her uncle) were outside waiting for us. We piled into the black SUV and began the journey to the Great Wall ($73 per couple), stopping along the way to pick up breakfast at Holiland Bakery. 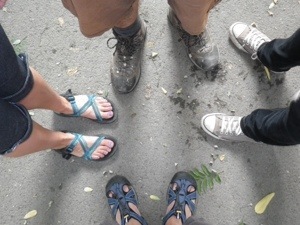 With our cheese-bread, cashew croissant and a bear claw in hand ($4) we were ready to scale the Great Wall of China. Luckily, by the time we were 3/4 of the way there, the decision to take the cable car up was unanimous. We walked through the stall-crowded alley and up to the ticket booth where Ridvan negotiated our student tickets for us ($4 park entrance + $13 for the cable car). We all walked into the cable car building, at which point, much to our surprise, Ridvan left us (“don’t worry, I’ll be waiting for you when you get back”) and up we went into the clouds. When we reached the top, we were literally inside a cloud with visibility of about 10 meters. The four of us convinced ourselves that we were lucky to have this unique experience. After all, we’ve seen pictures of the Great Wall on a beautiful sunny day, but not everybody has the good fortune to “see” it engulfed by clouds. The Great Wall is actually a conglomeration of many separate segments of wall, each with its own character. The section we saw at Mutianyu, like most of the sections visited by foreign tourists, is a reconstruction completed in the past couple decades and made to resemble what once was. The sheer drops on either side of the narrow expanse were quite impressive (even scary sometimes), and the deep ravines below only served to enhance the impressiveness of this structure. We couldn’t imagine climbing it, let alone leading an entire army up, through, and over it. So, we walked along, climbing staircases and ducking in and out of watchtowers and when we had finally gotten so high up that we practically could no longer see each other, we decided it was time to turn back. After retracing our steps, we found ourselves relieved to be back at the cable car. Back down at the bottom of the mountain, we stopped for a quick lunch of savory crepe and dried fruit ($2.50) from the stalls along the alley. Ridvan found us as we were finishing our food, and we agreed to make a stop on our way back at a teahouse. Dr. Tea was quite the tourist trap, but we enjoyed the demonstration of a traditional tea preparation and sampling a variety of Chinese teas. Ready to cash in our raincheck on the Peking Duck experience, we asked Ridvan to drop us off at Da Dong Duck Restaurant. Famous for its traditional Peking Duck and popularity with tourists, it did not disappoint. Hannah and Neil were very excited to sample the house specialty, along with a beautifully presented dish of snowing pork. We Turtles waded through 120 pages of menu before locating one of the few vegetarian options, and the braised eggplant and vegetable dumplings were indeed delicious. The meal ended on a high note with complimentary round of mango brûlée and lychees impressively served on liquid nitrogen. Hannah and Neil treated us and what a treat it was. Full, happy, and tired from a long day, we took the subway back and turned in for the night.